TOP Floor of the D Building! Closest building to the beach at the Dunes - Enjoy the penthouse view! Upgrades in 2017– New sliding glass doors leading to the balcony, a new counter height balcony table and chairs, two new leather swivel rocker recliners, and a new counter height dining room set. WINTER - FEBRUARY MUST BE RENTED WITH JANUARY. There is no monthly rate for March. March rents by the week. Come and enjoy the breathtaking view of the emerald green water of the Gulf of Mexico and the sugary-white beach of Panama City. Our condo is located on the 12th (top) floor of the D building at the Dunes of Panama which is the closest building in the complex to the beach. You can relax on the balcony that runs the width of the condo and watch the dolphins swimming and the sailboats skimming along. You have easy access to the balcony from the master bedroom or the family room. The kitchen was remodeled in 2015 with new cabinets and granite counter tops and all new stainless steel appliances. You will find all the necessary cooking and eating utensils for an enjoyable dinner in if you choose. We also went the extra step and removed the wall in the kitchen which absolutely opens up the condo giving it an open and airy feel. You can relax in the spacious master bedroom on the King size bed and enjoy the gorgeous view of the gulf or you can watch your favorite show on the 32” flat screen TV. A new beautiful tiled shower was also added in 2015. The guest bedroom has two full size beds. It also has a 32” flat screen TV with a DVD player. The family room has a comfortable sofa with a queen size bed and two swivel, rocker recliners so you can kick your feet up and relax and enjoy the amazing view or watch TV on the 50” HD flat screen TV. There is also a DVD player. We have made arrangements with the on-site rental company in the C building to handle our check-ins/outs and any cleaning or maintenance issues. This assures that any problems can be handled quickly on-site. If the problem is not resolved to your satisfaction, you can also give us a call. These are just a few of the great reasons to choose our condo! 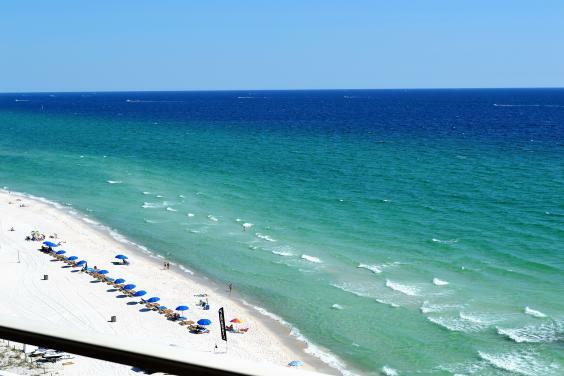 The beach is absolutely gorgeous and we hope you will think our condo is too. We hope you’ll be our guest and enjoy the beauty of God’s creation. PLEASE NOTE: If you are looking to rent two condos or if you would like a condo on a lower floor, please view our other condo at VRBO Listing #248717. WINTER RENTALS: Please note that February requires a 2 month minimum rental - January and February together. Monthly rates are not available in March. Our condo association rules require our renters to be at least 25 years old or be accompanied by two parents or legal guardians for the length of the stay. This is strictly enforced.